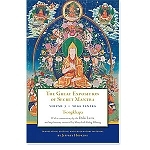 Pabongkha Rinpoche’s masterpiece The Essence of the Vast and Profound is one of the great “undiscovered” classics that is now being revealed to English-speaking audience for the first time ever. 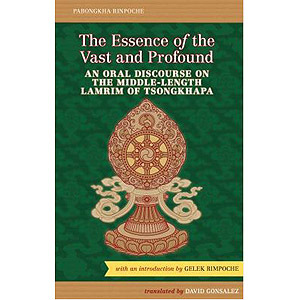 This awe-inspiring text is a commentary on Lama Tsongkhapa’s Middle-Length Exposition on the Stages of the Path to Enlightenment that will soon find its place as another one of the greatest Lamrim commentaries ever given. Given over the course of thirty-six days in 1934 in Tibet’s capitol city of Lhasa with over a thousand in attendance, The Essence of the Vast and Profound covers the entire spectrum of the Buddhist path. Pabongkha Rinpoche masterfully weaves together The Middle-Length Exposition on the Stage of the Path to Enlightenment, the Second Panchen Lama’s Swift Path, and the Third Dalai Lama’s Essence of Refined Gold into a breathtaking discourse that not only informs, but inspires the reader to follow the path to enlightenment and reach the supreme state of buddhahood for the welfare of all living beings. Hardcover, 2014 edition, 715 pages.